For optimal operation of our production units, the techniques used have been carefully selected. We make our know-how available to you in Africa where most of our experience is based. The often difficult, operational conditions continuously push us to reinforce the limits of robustness. Our first African installations have up to the present day, exceeded 200,000 hours of production. Our oxygen production units are delivered on the basis of full turn-key service including on-site start-up and training. Unlike other oxygen production processes, (liquefaction, electrolysis, etc. ), the PSA technology, is characterized by very easy use and maintenance, reduced power consumption and consequently, very limited operating costs. Mounted in an ISO container serving as a technical workshop, the CRAFT® units can be used in their place of operation, but also as mobile production units. Equipped with pneumatic regulation, controlled by an entirely programmable automatic control system, or by an automatic safety system, our units have the best management system on the market, guaranteeing real autonomy. The reduced supervision being incumbent on an electromechanical technician, the daily management can be done by a single warehouseman. All the CRAFT® units, irrespective of their level of development, of their use or on their maintenance, are compliant with the standard ISO 10083 regulating medical gas systems. Gauge of high quality, the manufacture is based on equipment coming from world renown specialists such as ATLAS COPCO, BURTON CORBLIN, PARKER, RIX etc. which facilitates considerably the supply of potential wear parts or spare parts. Craft ® units offer you a very economical alternative to’ purchase of’oxygen from outside suppliers. 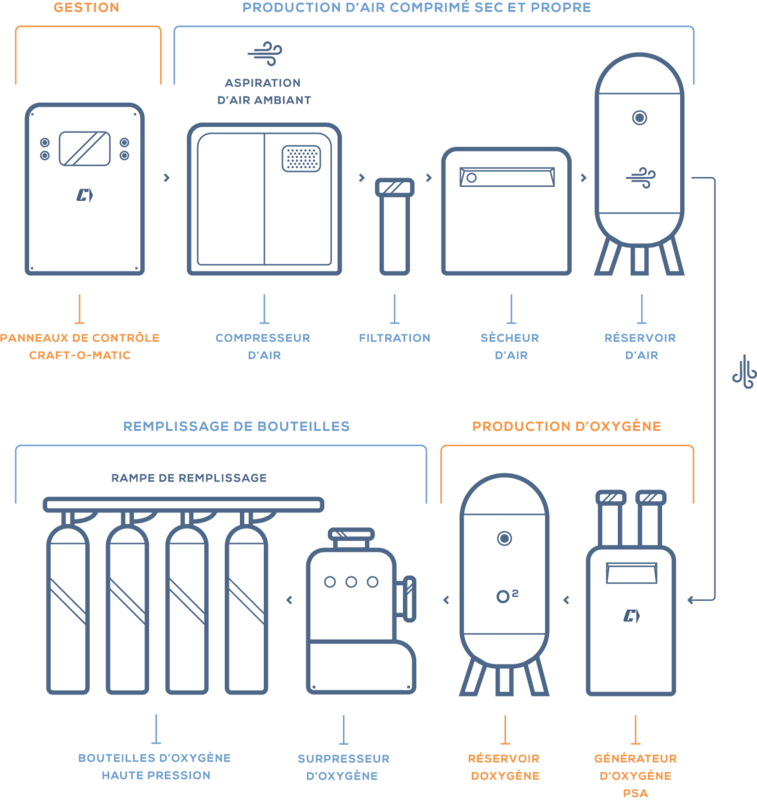 The average cost of filling’a bottle, of 7.5 Nm3 to 150 bar, by one of our units comes to less than1€ (staff, power and maintenance included). Do you need help or further information ? Learn more about What solution to use?